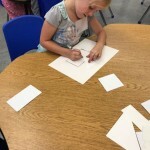 First Graders Practice Making Secondary Colors! how do you make purple? 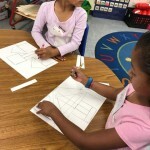 First Graders were able to practice lots of vocabulary with this painting project, including their shapes, colors, and counting. 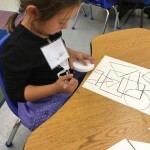 Tracing is a surprisingly challenging task for some first graders, and is a valuable writing tool as they have to use both hands, hold an object steady, and work their writing hand all the way around it. I feel that this is a safe and entertaining way for them to practice what can be a frustrating skill. 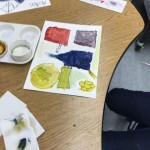 In terms of sharing colors, working with one set of paints for an entire table again gives students a safe way to practice making choices, listening to peers, and problem solving: what happens when your friend mixes the colors? How do you solve the problem? 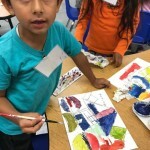 Thank you for your continued support: Laurel Dell PTA teachers, parents and students, the Walker Rezaian Creative Hearts Fund, and the California Arts Council.